Talent Economics offers an outside-in view on talent that brings workforce analysis, management practice and strategy together using economic inquiry. Award-winning talent strategist and leadership coach Gyan Nagpal presents business leaders an opportunity to step back and understand the ebb and flow of global talent before translating this new understanding into a winning strategy. 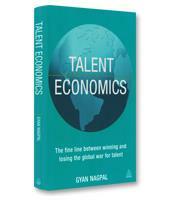 To understand key global trends in talent resources. How to develop purposeful leaders and innovators. How to manage the diversity of human resource present in today's global marketplace. How to apply macro and micro talent economics. How to develop a 21st-century talent strategy.